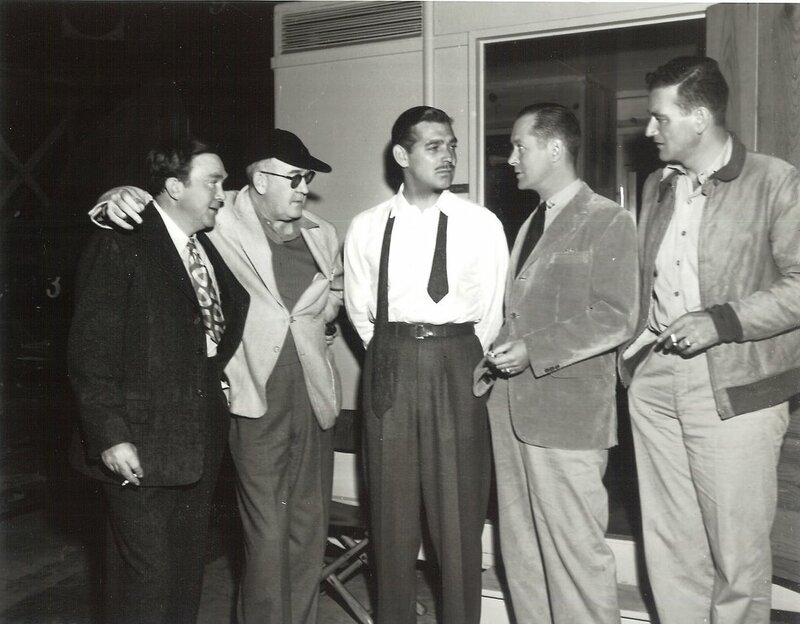 So, here's the official studio caption from the back of the still: "VETERANS ON THE SET .... Clark Gable, back in his first screen role following release from the army, visited by other veterans from the "They Were Expendable" set at Metro-Goldwyn-Mayer. Left to right are Thomas Mitchell, Commander John Ford, Gable, Lieutenant Commander Robert Montgomery, and Ward Bond." That's the set of Adventure by the way, and the guy on the right sure as hell ain't Ward Bond. And he ain't no veteran either (neither is Tommy Mitchell, but he's kinda old, and besides, he got hurt pretty bad that time he fell off the horse trying to catch those carpetbagging Yankees). Well, just imagine how John Wayne felt when the old man suggested they walk over to the adjoining stage and visit Major Gable. I bet Ford, I mean Commander Ford, made Duke go, just for the hell of putting him on the griddle for not having served. We've read those stories about how the director humiliated Wayne in front of cast and crew during They Were Expendable ("For God's sake, Duke, can't you at least salute as if you'd been in the service?"). John Wayne looks really akward in this still --- standing behind Lt. Commander Montgomery, and like, totally shut out of the bull session. You can see where Ford's brought Mitchell into the circle, because, well, he couldn't help falling off that horse, could he? Anyway, what do you suppose these guys were saying? My guess is, Ford told some colorful anecdote about that time on Midway when the enemy shot the 16mm camera out of his hand. Gable probably recalled the day he was nearly shot down during that bombing mission over Germany, and Montgomery no doubt regaled the guys with some of the close calls he had aboard those speedy little PT boats. So, what does Duke say? Nothing, if he's smart, and I've always read that Wayne was a pretty bright guy. I mean, what if he had interrupted with some lame story of how he nearly fell off a tractor last year while they were shooting The Fighting Seebees? Can't you picture Montgomery turning around and just looking at him? I'll bet Ford made fun of Duke right when they shot this picture. He could be a cruel guy. Yeah, I've read about how he could be a cruel guy. But he still made great movies. All these fellows did. There's a lot of hindsight drama to be mined from these old set candids, and we hope to be delving into a lot more of them in months to come here at the Greenbriar.